The second largest city in Mexico, Guadalajara is located 540 kilometres northwest of Mexico City in the Sierra Madre Occidental mountains. It is the capitol of the state of Jalisco, one of the largest and wealthiest states in the country. After four attempts, the city was founded in the Atemajac Valley on the 14th of February, 1542. 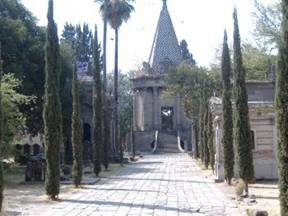 The 2005 census placed the population of Greater Guadalajara at 4,000,000 but locals believe it is over 7,000,000. Greater Guadalajara includes 6 boroughs or municipalities – Guadalajara, Zapopan, Tlaquepaque, Tonala, Tlajomulco and El Salto. 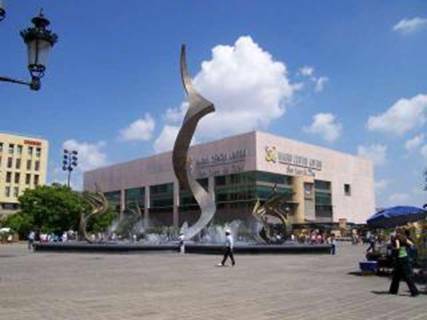 Guadalajara has an ambience that is different from most large cities. Although you might not notice it from the speed and intensity of the traffic, the mood among the populace is friendly and laid-back. After dropping the children off early at school, Tapatios will work for a few hours, then meet business associates or friends for a leisurely mid-morning breakfast. After a couple of more hours of work, its time to pick the kids up and take them home for lunch – the big meal of the day. A return to after-school activities and work at 4:00 will last until about 7:00 PM. Then, it’s off home for some relaxation and a light dinner at 9:00 or 10:00 PM. Sunday is family day, and you will see families cycling or picnicking or strolling along shopping together. Guadalajara is the birthplace of some of Mexico’s best-known cultural exports: tequila, mariachi music, charros (cowboys) and charreria (Mexican rodeo), and the sombrero. Tapatíos will tell you that just about everything good about Mexico comes from Guadalajara. Known as the “Silicon Valley of Mexico”, Guadalajara is home to several high tech firms’ manufacturing facilities including Hewlett Packard, Sanmina and others. Guadalajara has also been described as the “Florence of Mexico” by art aficionados because of its wealth of murals on the ceilings, domes and stairwells of public buildings throughout the city. A Tapatio, Gerardo Murillo (known publicly as Dr. Atl) is credited with developing muralism in Mexico and mentoring many of the most well-known of the early 20th century muralists. The magnificent architecture of historical churches and buildings is a treat for visitors. In the Downtown one can’t miss the Cathedral with its symbolic towers, the Teatro Degollado from the 19th century, the Cabanas with their murals painted by renowned Jose Clemente Orozco, and throughout the city, the fabulous public sculptures and art in the “glorietas” (traffic circles) and parks. 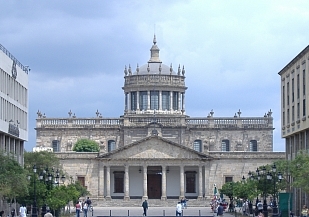 The University of Guadalajara houses murals by Jose Clemente Orozco (dome of the assembly hall), and David Siqueiros and Amado de la Cueva (in the Octavio Paz Library). The State Government Building contains a famous work by Orozco in the stairwell and the State Library contains a mural by Gabriel Flores on the dome of the reading room. The Degollado Theatre has a mural on the dome created by Gerardo Suarez and Jacobo Galvez. Guadalajara City Hall has a Gabriel Flores mural depicting the founding of the city. The Zapopan City Hall has a Guillermo Chavez Vega mural in the stairwell. In the Centro de la Amistad Internacional is another Chavez Vega mural on the dome. 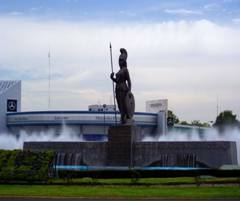 Minerva is the largest fountain/statue in the city of Guadalajara. The Roman goddess of war, poetry, medicine, wisdom, commerce, and crafts she stands 20 metres high amidst a fountain 74 metres in diameter. Created by sculptor Joaquin Arias, the base contains the names of 18 Tapatios who were most instrumental in creating the city. Los Arcos is on Avendia Vallarta, not far from the Minerva statue. 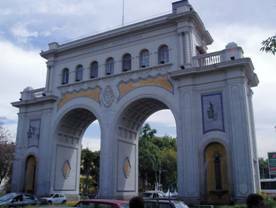 Not in a traffic circle, this 14 meter double arch was built in 1942 by architect Aurelio Aceves to commemorate the city's 400th anniversary. Reminiscent of European arches, this one contains the coat of arms and welcoming words for visitors, but is far from the entrance to the city. 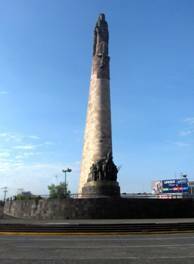 An imposing monument 50 metres high which honors the legend of 6 cadets who refused to surrender during the American invasion of 1847, this statue stands at the intersection of Avenidas Chapultepec and Niños Héroes. Made from pink canterra stone, it was crafted by Juan Olaguíbel. 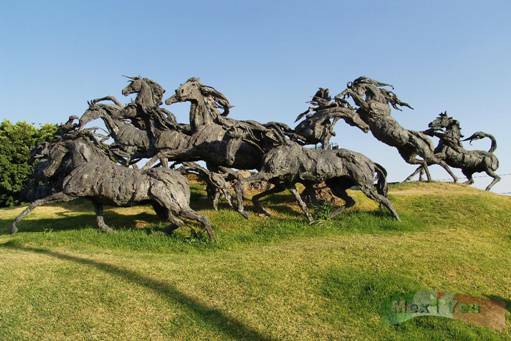 This sculpture, located in the Glorieta de las Jicamas at the intersection of Lopez Mateos and Niños Heroes, depicts a thundering herd of wild horses. The action and dynamic of the sculpture is incredibly life-like. It was designed and forged in bronze by Jorge de la Peña. This fountain, in Plaza Tapatia, contains a large impressionist sculpture that represents the immolation of Quetzalcoatl, the Aztec chieftain. The hand-forged bronze figure measures 25 metres in height and takes the form of a giant flame. It is the work of artist Víctor Manuel Contreras. Guadalajara is blessed with an extremely benevolent climate. While temperatures may drop to low single digit levels during the night in mid December, and rise to the mid 30’s during the day throughout April and May, the average is very pleasant. 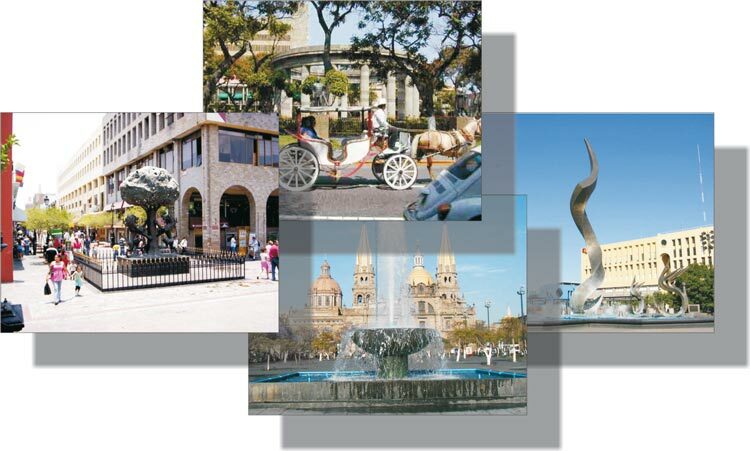 A blend of old-world charm and modern efficiency, Guadalajara has something for everyone. Large, modern shopping plazas co-exist with neighborhood iron works and mechanics’ shops. Elegant estate homes are not far removed from walk-up apartment buildings. University and college campuses are sprinkled throughout residential and business neighborhoods. And everywhere there seem to be excellent restaurants and bistros for a light refreshment or full meal. 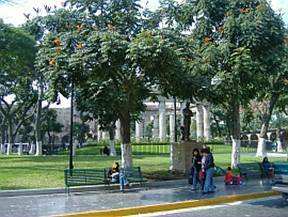 Four plazas comprise the core in the centre of the city, marked in the form of a cross at the Cathedral – Plaza Guadalajara, Plaza Liberation, the Rotunda of Famous Men and the Plaza Armas.